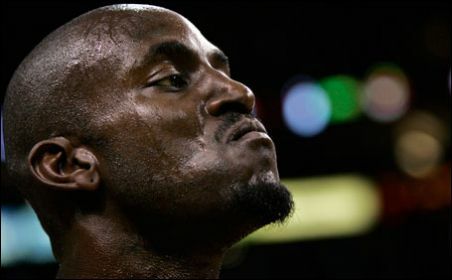 yep, ol KG looks unhappy in this pic, but admit it, Kevin Garnett is the best thing about the NBA right now. Kash!!!!!! brilliant to hear from you man, thanks for checkin out the blog as well. yeah, the french lost out to the south africans today which completes their ultimate demise + i read that their coach was using the players astrological signs when determining who to play, wack. Yep, the UK also seems to have collapsed in the tournament, which i'm not too bummed about as i am not much of a rooney fan. lets put our last hope on the man with the greatest name in soccer, SHITTU!!!!!!! !